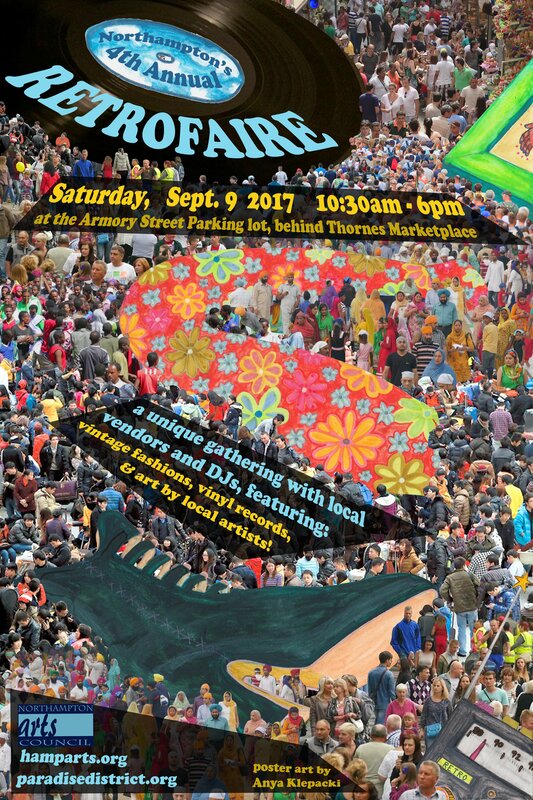 The Northampton Arts Council presents the fourth annual RETROFAIRE, an open-air market featuring a bounty of vintage fashion, unique reclaimed and re-purposed jewelry & design, as well as hard-to find music gear and vinyl records to be held on Saturday September 9th. RETROFAIRE will be held in the space between Thorne’s Market and the Northampton Parking garage. All proceeds benefit the Northampton Arts Council’s BJ Goodwin Fund. A grant designed to provide direct assistance to a Northampton-based artist, writer or arts organization in recognition of exceptional work and to support the further development of artistic talents. Our vendors include Tiny Anvil, Vintage Steele, Spin That! Records, Rambling Sam & Sons, Vapour City Vintage & more. Why not spend a day supporting art, buying art and wearing art, all while listening to great music and enjoying the savory smell of fine foods wafting in the background. Come to RETROFAIRE and enjoy the search for quality items that will impress your friends of every generation. Where: Armory Street Parking Lot, 1 Kirkland Avenue. Behind Thorne’s Market and the Northampton Parking garage.